This Sampler Gift Box is the perfect choice for sampling some of Boss Hog's favorite products. You'll get 1 pack of our best-selling Hickory-Smoked Bacon, 1 bag of Maple Bacon Pancake Mix, 1 pack of Boss Hog's Fully Cooked Bacon Bits and 1 jar of Boss Hog's Bacon Seasoning to make everything taste like bacon! Last but not least, you'll get our famous Bacon is Meat Candy™ black t-shirt, because we know you want to look stylish while whipping up a gourmet bacon meal. Use the drop down box above to choose t-shirt size. Includes a gift box for easy gift giving to your favorite bacon fan. *This gift bundle includes a free gift box. We used the Bacon Bundle as a give-away at one of our events and people LOVED it! The winner was thrilled! Simply, awesome! Bought for my teenage son who is a bacon freak he loved it. My husband loved his fathers day gift. Impressed with the quality of products. Impressed with the quality of products. The bacon seasoning is amazing and cool shirt. We own a home based business and sent several of the gift boxes to customers. They have all been very happy with their gift. I think we out shined all the other gifts they received this year :))). 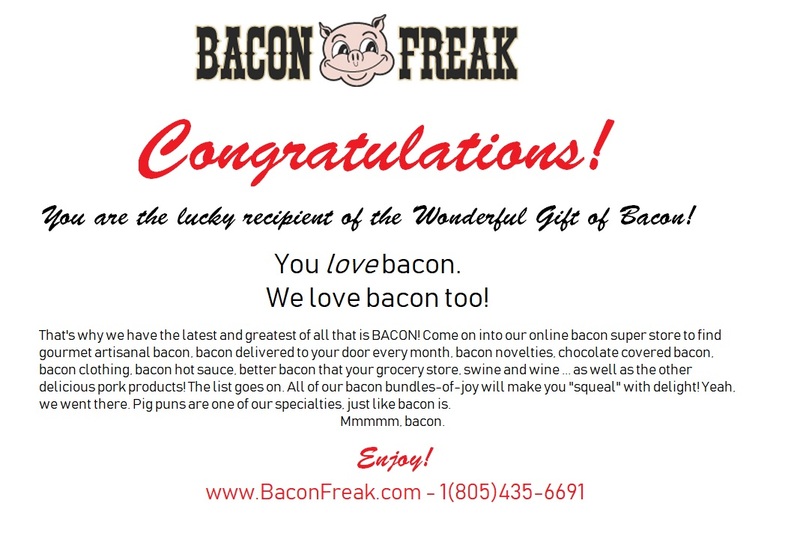 Thank you Bacon Freak!! OMG! The bacon, pancake mix, bacon bits, and bacon seasoning are all AWESOME! OMG! The bacon, pancake mix, bacon bits, and bacon seasoning are all AWESOME! Within a few days after receiving my order, all the food was eaten completely. I wear the T-shirt proudly around my city too!